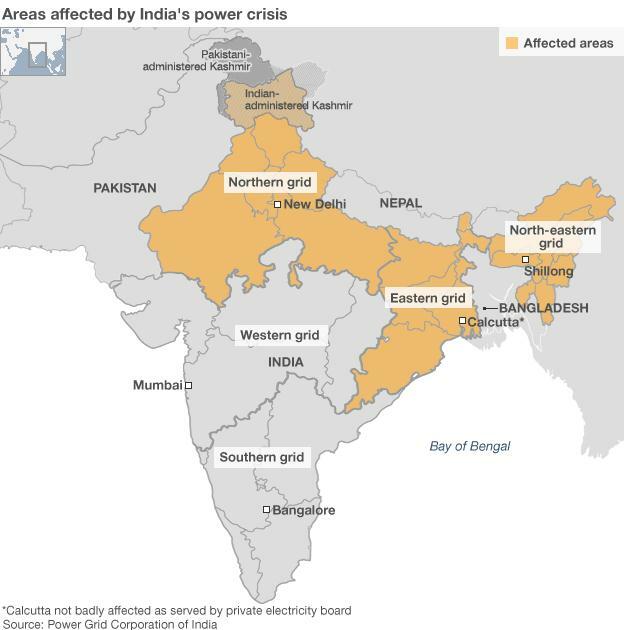 India’s Outages: What Can We Learn? 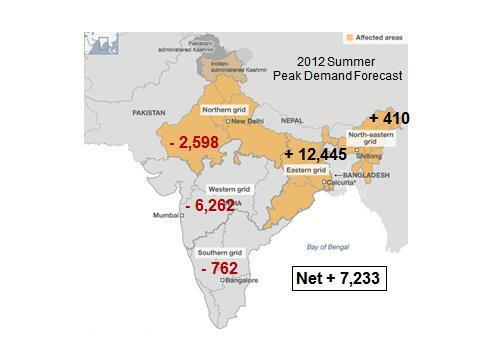 India’s recent national outages on July 30 and 31 have received a great deal of attention in the press. Nearly 800 million people were without power and India suffered hits to its economy and its global reputation as a result. Years from now some definitive report will outline the details, but enough is known now to glean some important considerations for energy policy makers. While some may quickly dismiss the event as endemic to uniquely Indian conditions, the event highlights a number of important considerations for grid operators, engineers and policy makers in other countries. Here’s a very quick summary of India’s grid status and what we know about the events that ultimately tripped much of the national grid. 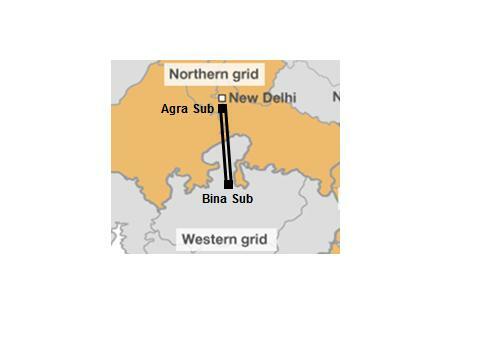 India has five regional grids: Northern, Western, Southern, Eastern and North-Eastern. The Northern, Eastern and North-Eastern grids were affected by the outages. India has an abundance of generation in the Eastern and North-Eastern grids, primarily coal, but the other three grids are in deficit at peak periods, regardless of season. It doesn’t take a transmission planner to see a looming problem here. While the summer is theoretically in net surplus, potentially significant swings in demand in the Northern or Southern grids could quickly upset the balance. The national grid company, Power Grid Corporation of India, Ltd. (PGCIL) has been constructing a number of HDVC and HVAC lines to link the regions. Most transmission links are AC; at present there are 3 HVDC lines in operation, with three more under construction. Regional Load Despatch Centres (RLDCs) operate the regional grids. The RLDCs are theoretically under the control of the National Load Despatch Centre (NLDC). The NLDC and the RLDCs are wholly owned subsidiaries of PGCIL. Like the US, India has a patchwork quilt of regulatory jurisdictions. Each of the 28 states has its own regulatory body run by elected officials, the State Electricity Regulatory Commissions (SERC). Each SERC is autonomous. Federal regulation is provided by the Central Electricity Regulatory Commission (CERC), however all real control lies with the SERCs. There is far more political maneuvering within India’s regulatory bodies than in the US, however. Rate increases only occur immediately after elections, for example, and while the US is not immune to parochial decision making, it is rife in India. In both disturbances, heavy power flow on the Bina -Agra line exceeded limits. This particular line connects the Northern and Western grids through two 765 kV circuits that have been operating at 400 kV and is one of four major corridors between the two regions. At the time of the outage, one of the circuits was being upgraded to 765 kV and was out of service. The operating line had a Surge Impedance Loading (SIL) of 691 MW but was operating above 1,000 MW. Apparently several circuits in the Eastern grid were operating above SIL as well. In addition, frequency regulation deteriorated to 47.69 Hz in the 50 Hz system, reportedly because of a refusal on the part of some states to install frequency regulation which would have initiated automated demand reductions. As in the case of the SIL standards, states continued to draw on generation at system frequencies that were below regulatory minimums. Although some reading between the lines is necessary from subsequent corrective orders, the NLDC in a memo to the regions noted that, in addition to the protective technology “mis-operations” the outage was exacerbated by the fact that there was sustained high loading during a period of high ambient temperatures and the absence of dynamic reactive power compensation resulted in voltage dips in the system. The NLDC’s primary corrective action was to demand that operational protocols and limits be enforced by the RLDC’s throughout the system. The Indian press has speculated that many of the seemingly technical problems were in fact man made. In India, access to reliable electricity directly correlates to economic growth. Those regions that have reliable power are prospering; the have-nots are not. Electricity is becoming seen by some as a right. If the electricity is less reliable, or unavailable, it’s the politicians that are blamed. The Indian press alleges that before this event, controls and technology such as under frequency relays were not enforced or installed because of political intervention; during the outage some politicians in the states of Uttar Pradesh, Haryana, Punjab and Rajasthan demanded that no power reduction measures be taken so that their state would continue to be served. The inevitable cascade then occurred. Twice. With one exception: the Southern grid is not synchronized with the others and is linked via an HVDC line, providing that grid with a firewall against cascades in the other systems. We also know that the system had a warning the day before. On July 29 the Bina – Agra line had a “near miss” due to the same set of circumstances. Clearly there are several very obvious lessons learned here: never take a major line out of service during a peak power period; and protective technologies; operating limits are worthless if they are not engaged or ignored; and HVDC interconnections of asynchronous grids do, indeed, isolate grids from cascading disturbances. More important, however, are the longer term implications. Transmission investment and demand growth mismatch. This issue is perhaps best highlighted with a comparison of India and China. The two countries share some similarities: huge populations; high economic growth; and growing electricity demand. India and China are in the process of building High Voltage DC lines to both link regional grids and to import large amounts of power that happen to be located in regions of low demand to the high demand areas. But that’s where the similarities end. See below. India’s planned investments in transmission do not seem to keep pace with its demand. Over reliance on central generation. About 55% of Indian generation comes from coal fired thermal plants. At present 87 GW of coal units are under construction and another 380 GW are in some stage of planning and permitting. It is not at all clear that an already fragile transmission network with limited forecasted investment can accommodate all this new generation. In addition, the outage occurred because of overloading at a peak period. And of course, base loaded, multi-GW sized coal plants cannot solve the peaking problem inherent in the Indian system. Perhaps the more important consideration is whether or not complete reliance on the central generation paradigm continues to make sense. Perhaps some portion of this massive investment in large scale generation plants might be better directed to increasing transmission capacity, especially using multi-link HVDC, placing a much higher reliance on distributed generation; and optimizing the network as it currently exists. Many of the most prosperous economic zones in locations like Mumbai are prosperous simply because they have installed their own generation sources, shielding them from the poor reliability of the public network. Distributed generation can add considerably to balancing load disparities across the various grids and act as an effective supply (when aggregated) during peak periods. In addition, India has considerable solar and wind resources that are not being utilized in the Western and Southern regions. 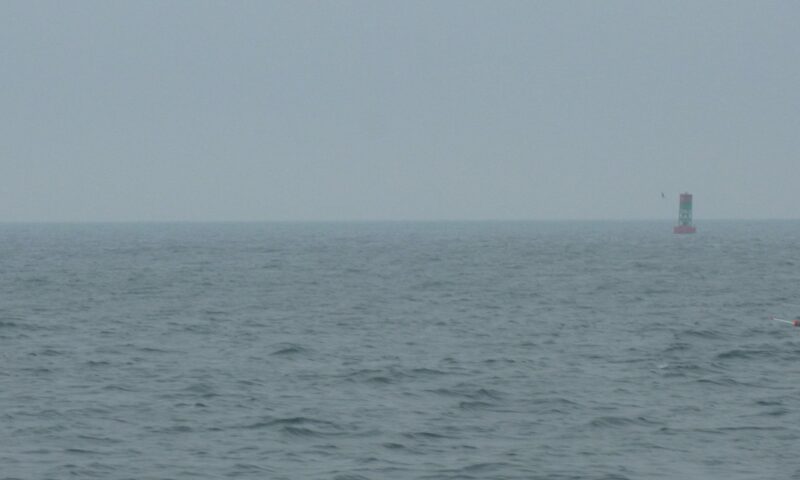 Absence of a true national grid. Indian economic planning, including its energy infrastructure planning, is driven by a 5 year planning process. The 11th 5 Year Plan ends in 2012; the 12th 5 Year Plan is in development. The ability of state entities to override RDC’s and the NRDC effectively renders India’s “national” grid impotent. As the 12th Plan is completed, investments in infrastructure need to be coupled with strong means to implement national policy and national control. VSC vs. CSC HVDC technology. All of the currently planned HVDC lines in India are expected to use current sourced converters (CSC). CSC systems are tried and true, and have the ability to cope with the very large capacities intended by Indian system planners. CSC systems do not offer several advantages of voltage source converters (VSC), which include independent continuous control of active and reactive power, dynamic voltage control, and multiple stations. VSC technology is currently limited to about 1,200 MW at 500 kV, whereas CSC can reach 16,000 MW at 800 kV, however VSC is making rapid advances. India’s currently planned lines may need to be CSC technology, however new lines might be best suited for VSC technology. Smart Grid technology. Putting aside the jurisdictional control issues, clearly the Indian system has no ability to visualize the state of its system on a real time basis and does not rely on any automated protective systems. Any number of technologies could have made a difference: dynamic loading; synchrophasors; Flexible AC Transmission (FACT) systems; etc. Over reliance on the central generation paradigm. Difficult as it may seem, these are real issues for which there are no easy solutions. We may not be as fortunate as the Indians to have a wake up call like having half our population in the dark for two days.